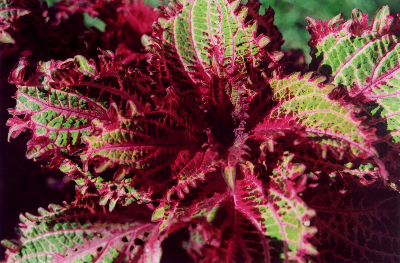 Coleus is a good choice for summer color. June is the beginning of the rainy season. It's hot, humid, and wet, as there are usually rainstorms every afternoon. Heat indexes can get into the triple digits during midday, and the air can feel like a sauna. There is much to be done in the summer garden in South Florida, even some planting. This is the most important planting month for those without irrigation systems. Mother Nature does most of the watering, and plants can get roots established so they can withstand the dry season. There are some annuals that seem to be bulletproof in the torrid Florida sumers. Old favorites like marigold, vinca, torenia and zinnia can be planted this month. Keep in mind that zinnia will have problems with powdery mildew as the summer humidity worsens. Coleus and caladium provide summer color when all other flowers have faded, but require shade from the intense sunlight after midday. June is a great month for propagating plants by mechanical means. Some plants will root just by sticking cuttings into the ground. Make sure to water daily for the first two weeks if there is no rain, and twice a week afterward. June is the best time to cut back hedges and shrubs, but be careful not to prune back more than 1/3 of the plant. Cloud cover in June will minimize sun scale. Be sure to remove all dead wood, hollow trunks, and branches that are crossing or rubbing against each other. June is a busy month in the South Florida garden, so be careful to stay hydrated and do most of your work in the early morning and early evening to avoid heat exhaustion.